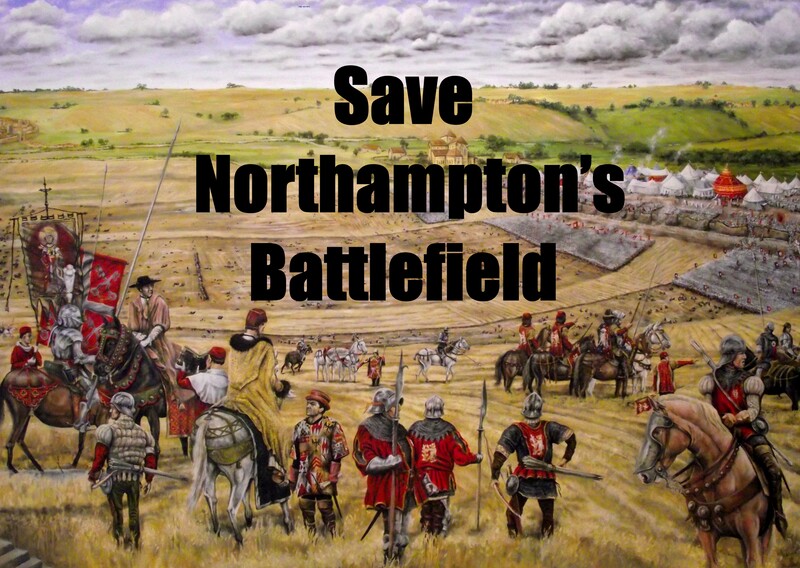 The 1460 battlefield is under threat again. We will of course be objecting as there has already been enough development of this wonderful green space of national historic importance. Now is the time to say enough is enough.We need to show anybody else that might be thinking of developing any other part of the battlefield that its not wanted. If you agree please object as detailed at the bottom of this post. Please share with your friends, colleagues and other pages and impress the importance and it should not be left for others. The two press reports both of which, as the application states, say there was nothing of archaeological importance found. The actual report of the finds is ‘hidden’, deliberately, accidentally or otherwise within the photograph section of the application documents. And as you will see below, are actually of great significance. The application says that responses are required by 28 August, so an early response is essential. The area concerned is green space and parkland, there for enjoyment and use of the community. This development would considerably erode that sense of open space, and once gone, will never return. Whilst the application makes provision for the protection of any further archaeology below ground, it does not consider the environment that will be destroyed in its creation. This is a registered battlefield protected by the National Planning Framework which says that any development on the site should be wholly exceptional. The application does not say how this car park etc. is exceptional. This application does not give figures or demonstrate the need for additional parking, and there is no analysis of car park use. It is not for the benefit of the golfers themselves but a separate commercial enterprise to ‘sell’ parking spaces to workers on Brackmills Industrial Estate, as an early morning visit and comparison between the number of cars and number of golfers clearly demonstrates. By allowing this application it will be condoning the golf clubs earlier action of illegally carrying out the work without prior planning permission, and against the CMP. The councils own Conservation Management Plan for the battlefield was adopted as part of its planning decision framework and the CMP says it should resist further development within the Registered Battlefield. The application fails to address how it complies with this section of the CMP and therefore should be rejected. The CMP effectively acts as a local designation of the heritage asset and implies that substantial impact on the battlefield occurs with any further development on the registered battlefield and the Council needs to take this into consideration when reaching its decision. Crucially, the report clearly states there has been insufficient evidence found to date that can categorically discount the round shot from being from the 1460 battle. There has also been numerous finds of round shot of these sizes found elsewhere in England and dated to the medieval period (see Portable Antiquities Scheme database). The only way to determine the date of the shot is ‘uranium thorium lead isotopic analysis’ and this has not been carried out. If, the shot is proved to be from 1460, then this could not only be a crucial part of the battlefield but also of national significance in that it is the earliest known use of hand-gunnes in England, and be the oldest surviving small round shot in England too. Until the whole registered battlefield has been archaeologically investigated and understood, the true significance of this area cannot be known. In the long term, this area might prove to be a part where a future battlefield trail etc. could be sited. It is therefore extremely short-sighted to allow any development of this sensitive area at this time. The ball pit and trench is an addition to the original application and should not be included in this one. Furthermore, there is no evidence to suggest that the site of the trench is made up ground and given the significance and sensitivity of site, it needs a full archaeological survey before any planning permission can be considered. You may of course have other reasons why this application should be rejected, please add these too. The application says that NBC will respond before 23/09/2015 but does not give a date when it will go before planning, so an early response is essential.